It can be a real throne, or a sacred mountain or aother item where the deity can reside. The place within a shrine where symbols of the kami (mitamashiro) are enshrined. In Shrine Shinto, a building is constructed as a place to worship the kami. 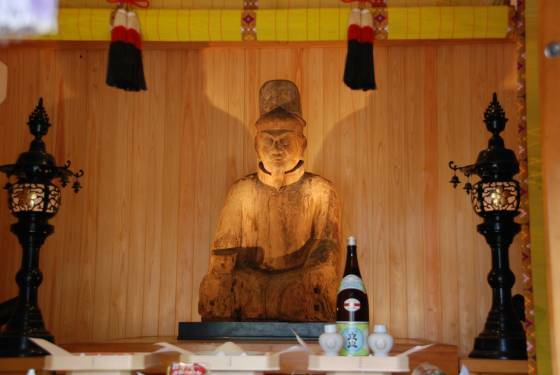 Within that building a shinza is established, decorated in a manner appropriate for a dwelling of the kami, and furnished with an object (called a shintai) representing the presence of the kami. in the gongenzukuri style, the otoku type is appropriate. The term ontamanai can also be written with characters meaning "a jewel is present," indicating a beautiful seat for the kami. Four pillars are built on bases set in each of the four corners, and these four pillars in turn support a decorated roof. Representative examples include the Grand Shrines of Ise, the Atsuta Shrine, and other shrines in the shinmeizukuri style. 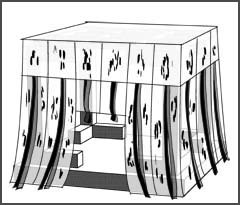 The michōdai style consists of a raised seat surrounded by a screen and is based on the same structure found in the main rooms of shindenzukuri-style dwellings built by Heian-period nobles. Many shrines are constructed in this style. The otoku style originates with the mitana (storage cabinets) used in the food-preparation room (mizushidokoro) of the palace. The divine seat here takes the form of a cabinet with two doors that open to the front. Examples include those found at Kashima Jingū and Dazaifu Tenmangū. Other styles of shinza are also called takamikura, hirashiki, daishōji, omiya, and shin'yo. Since the Japanese tenno 天皇　Tenno was considered a deity, his resting places are included. 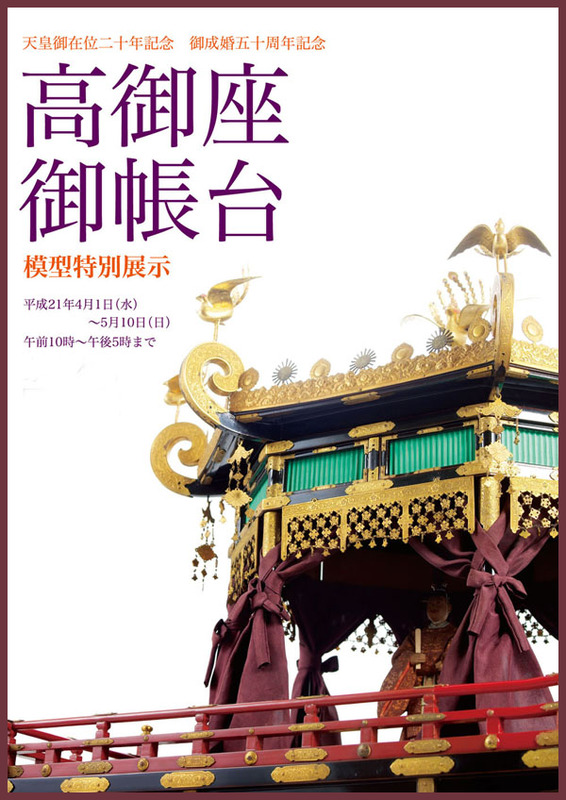 takamikura 高御座 "throne for the deity (Tenno)"
In Shinto, shintai (神体, body of the kami), or go-shintai (御神体, sacred body of the kami) when the honorific prefix go- is used, are physical objects worshipped at or near Shinto shrines as repositories in which spirits or kami reside. Shintai used in Shrine Shinto (Jinja Shinto) can be also called mitamashiro (御霊代, spirit replacement or substitute?). In spite of what their name may suggest, shintai are not themselves part of kami, but rather just temporary repositories which make them accessible to human beings for worship. Shintai are also of necessity yorishiro, that is objects by their very nature capable of attracting kami. The most common shintai are man-made objects like mirrors, swords, jewels (for example comma-shaped stones called magatama), gohei (wands used during religious rites), and sculptures of kami called shinzō (神像), but they can be also natural objects such as stones, mountains, trees and waterfalls.
. WKD : Kagura Dance　神楽 . Fujitani san has written more poems about Mount Fuji.
. WKD : yamabiraki 山開 "opening the mountain" . 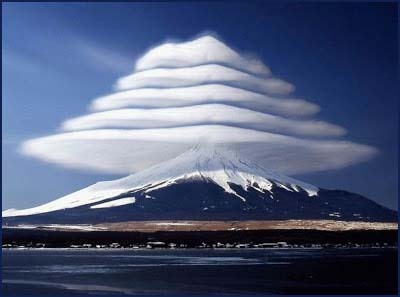 five layers of clouds on Mount Fuji - a very special moment - June 2007 !